How well do you know your barbecue food safety facts? How healthy is your summer barbecue? Put your knowledge to the test with these common nutrition and food safety dilemmas. It’s officially summer. Which means it’s also officially time to throw open the doors, fire up the grill and take your dining outdoors. But from the condiment table to the cooler, there are diet landmines everywhere you turn. And that’s just scratching the surface of the dangers that lurk at your outdoor barbecue. Food safety is a huge concern as the temperatures heat up and people take their cooking and eating out of the kitchen and into the backyard. When it comes to safely handling food and preventing food-borne illness this season, how do you stack up? 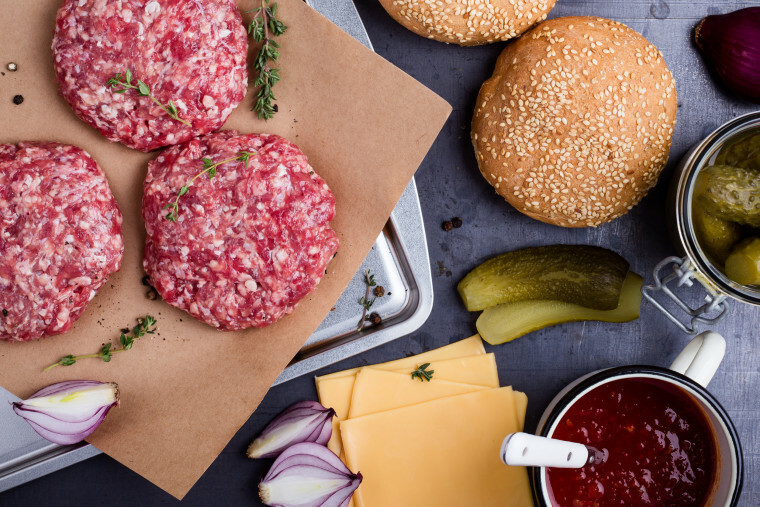 NBC News health and nutrition editor Madelyn Fernstrom puts your summer barbecue knowledge to the test with these common nutrition and food safety dilemmas. Quiz yourself now to stay safe later! You’re at the condiment table, is ketchup a better or worse choice than BBQ sauce? Ketchup is known for being a high-sugar topping, so you may be surprised to hear that barbecue sauce actually clocks in higher. Not only does it have more sugar per tablespoon, but it’s higher in calories and sodium too, says Fernstrom. In fact, “there’s 30 percent more calories in barbecue sauce,” she says. The best pick on the condiment table? Mustard, which has only 5 calories per tablespoon — plus you tend to use much less when using it to top hot dogs and hamburgers. Is potato salad a better or worse choice than pasta salad? Yes, they are both mayo-based salads, but potato salad — with fewer calories and more nutrients per serving — will be the better option when choosing a side. “Pasta salad is usually made with regular, white pasta. Potatoes are really a vegetable, and if you leave the skins on you’re going to get all of the nutrients of potatoes,” says Fernstrom. “Plus, when you dress a potato salad you’re usually going to use less dressing, whether it’s mayonnaise or a vinaigrette, than on a pasta salad. So you’ll get fewer calories and more nutrients.” And stick with a ½ cup serving size, she adds. Is beer a better or worse drink choice than a margarita? Is it better or worse to rinse raw chicken in the sink before cooking? You touch raw meat, and it’s time to wash your hands: how long should you wash your hands in order to kill the bacteria? Answer: (b) Wash for at least 20 seconds. How long can you safely leave food outside on the picnic table when it’s 78 degrees outside? How long do you usually sit outside picking at the food spread? Chances are, longer than two hours. But that’s how long you have before you need to bring it in and put it in the fridge, says Fernstrom. After this amount of time, the bacteria in food can multiply rapidly and lead to foodborne illness. When it’s a really hot day over 90 degrees, this window shortness to one hour, Fernstrom adds. The FDA tells us to ensure that food stays out of the “danger zone” — between 40°F and 140°F. That means cold food stays below 40°F, and hot food stays warmer than 140°F. What is considered a “safe” internal temperature for a grilled burger? Stick with medium — “food safety rules say that anything over 140 degrees is going to be safe, but it’s really hard to tell,” says Fernstrom. “Use an instant meat thermometer. You can’t just look at it or press it [and know it’s cooked through].” And if you are at high risk for foodborne illness — think: children, seniors, immune-compromised — stick with at least medium to medium well, since medium rare can be a bigger risk. What is the safest way to defrost meat? Answer: (a) In the fridge. What is the best way to marinate a flank steak? c. In a plastic container with its own lid. ANSWER: (a) big zip lock bag.